Today we have a guest post from Andy Tilly. Andy is the Pastor of Family Ministries at Crosstimber Church in Dallas. He’s an innovative leader in one of most dynamic ministries in the country. He’s a speaker, author, consultant, film maker and pretty nice guy! I’m thankful that Andy was willing to challenge us today! Over the last few years I have watched how video teaching has become much more accepted in churches and venues world-wide. Watching the idea spread has left me with the question of this: Will video worship ever be accepted as a useful tool in ministry as well? I personally haven’t heard or seen much written on the subject of video worship so when Rich asked me to write about it, my hope was to get the conversations flowing. 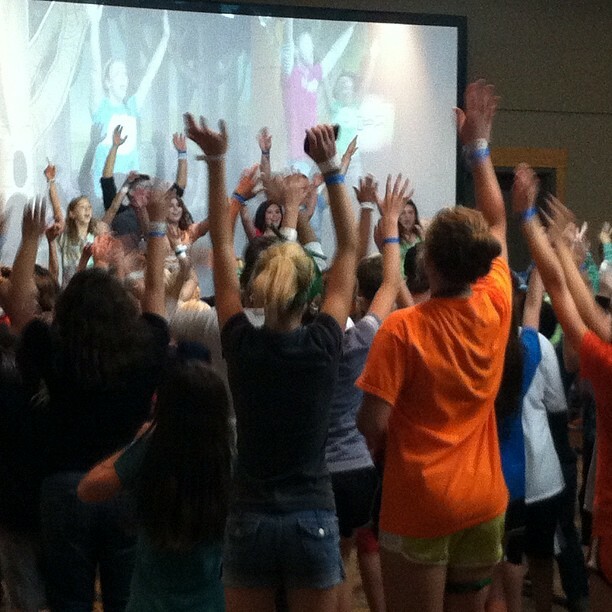 I have seen my children’s ministry use video worship for years and needless to say our kids love it. They dance around, sing-a-long and fully engage. But let’s be honest, those are elementary kids! So I began to ask myself, would a Jr. High or High School student ever engage in the same type of experience? I believed they would, if done right. Since we video teach our students already, we decided the first step was to slowly introduce it into our student experiences. We started with one song at first, then after a little time went to two. The next step was the big experiment! Could we do our student conference totally with video teaching and worship? Now with our student ministry we do video worship once a month and in a few weeks we will launch a total video experience for our students at a new campus. I could be crazy about all of this, but when you think about it so was the concept of video teaching not too long ago. In closing, I want to be transparent with you about our current atmosphere following the changes. 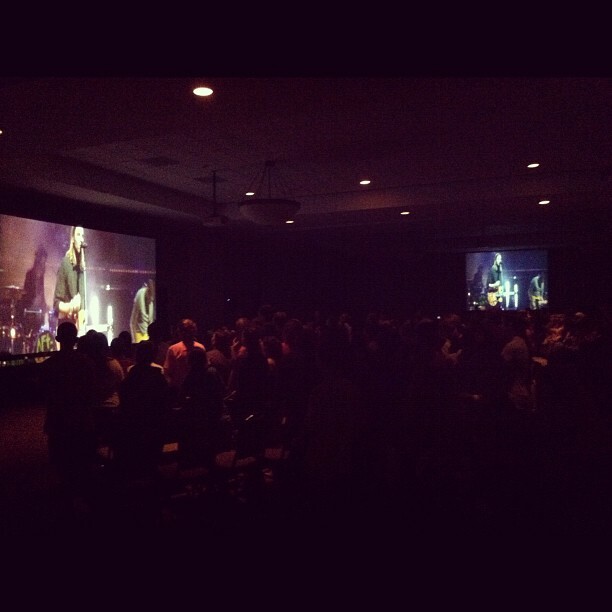 There are still some students who prefer live worship, but when we started video teaching some didn’t like that either. Overall, for many of our students they have come to know Jesus through these new methods of transmitting the Gospel! What are your thoughts or questions? Have you tried it? If so, what was your experience? Did it work? Are you or do you know of anyone doing this in their adult weekend services? What are your thoughts on not having a live worship leader engaging in what God might be doing in the service? What could it be like if we could start a church plant with great worship and teaching for under $10,000 using total video experiences? Is this a good idea for those who don’t have the money or space for their ministries? If you do use video worship, where do you get your video worship from? I like it. Can you give us some examples of the kind of video you use? I can think of many options (motion words and backgrounds, video of a band leading, video of the worshippers with word overlaid, etc…) but have you found anything that is working better than others? good question, we use several different ones from Elevation Church to Hillsong we also use footage from our churches live dvd. that seems to be the best for us, some of our kids stuff is just words and motions and it works for them and years ago i saw it work for teenagers but not sure if it would today! To be honest this concept of video worship for our upcoming church plant came to mind just the other night, my thought is to launch a church in a movie theater, so I as the lead pastor would do the live in person teaching, but I was pondering the idea of video praise worship in place of a live band. Pros and Cons to the idea. I am also thinking of as you all mentioned how effective it is in the children’s church setting, kids seem to jump right in….wonder if adults would do the same? I was also thinking trying to pipe into something like Elevation Network for a live video worship experience but the timing would have to work with time zones. There have been some churches that have experimented with video driven worship for adults. (Willow, Granger and North Point come to mind.) The fact that these three tried it in the past and don’t do it anymore tells me that the idea was a bit a head of it’s time. I think there is going to be a time coming where this will be as common as the video driven teaching we’ve seen grow up around the country. As for the leader … I think the idea of still having a worship leader on stage to augment the video is a great way to go. Thanks for everything you are doing! Thanks for commenting!